Soil balls made by students in the laboratory showing different colors. Credit: Antonio Jordán. Click to see the original picture at Imaggeo. Often, soil color is described using general terms such as “brown”, “red”, “dark”, etc. When I talk about this issue for the first time with my students of Soil Science, I use to ask them how to describe the color of a soil sample. Normally, in a few seconds, I get a list of color names ranging from dark brown to bright red, including “chocolate”, “coffee” and “dog belly”. Sometimes, we come to some consensus (for example, brown to yellowish brown), but in many cases I find very opposing positions. Then I show another soil sample with a very similar color, and ask them to say which one is more yellowish, green, brown or dark. Here now, discussions can be strong. Why do soil scientists describe soil color? One of the properties most commonly used by soil scientists to describe and classify soil horizons is color. Color is a physical property of soils that allows us to know some of its most important characteristics, such as mineral composition, age and soil processes (chemical alteration, carbonate accumulation, the presence of humified organic matter, etc.). The presence of water in the soil profile during long periods of time also affects soil color as a result of changes in the oxidation rate. Similarly, together with other physical properties, color helps us to differentiate between types of horizons of the same profile or different soil profiles. Red to greysh green colors in a soil profile as a consequence of redox processes. Credit: Antonio Jordán. Click to see the original picture at Imaggeo. What does soil color tell us? The substances resulting from decomposition of the organic matter are oxidized and acquire a dark coloration. On the other hand, some of these substances can be combined with mineral substances present in the soil as a consequence of mineralization of organic materials or chemical alteration of clays (such as iron oxides). After physical and chemical alterations, organic and inorganic materials contribute to soil color in different ways and proportions and, as a result, color is a product of co-working soil processes and environmental conditions. Soil color is related to soil processes, and is used as a diagnostic criteria for soil classification. In the WRB, for example, soil color is used as a criteria for classifying diagnostic horizons (albic, anthric, fulvic, hortic, hydragric, melanic, mollic, plaggic, sombric, spodic, terric, umbric and voronic horizons must meet certain color parameters), diagnostic properties (albeluvic tonguing, aridic properties, gleyic and stagnic color patterns), and diagnostic materials (limnic and sulphidic materials), and is used for supporting field indentification in many cases. Soil scientist (Dr. David Badía, University of Zaragoza, Spain), trying to find the dark colored surface horizon in a melon-cropped soil in Mallorca (Spain). Agricultural soils, for example, often have a color slightly influenced by organic matter, since the contribution of organic residues is much lower than in the case of forest soils. Thus, in this case, the distinction between organic and mineral horizons is much weaker, having to rely on other properties such as texture or structure. Dark and grey colors in a peaty soil in the Andean highland (Ecuador). Credit: Matin Mergili. Click to see the original picture at Imaggeo. Dark or black. Dark colors are usually due to the presence of organic matter, so that the darker the surface horizon more organic matter content is assumed (this is not an exact and one-to-one correspondence). It is characteristic of the surface horizon, but can be found in other exceptional cases (in Podzols, under acid conditions, transformed organic residues accumulate in the spodic horizon). The dark color is characteristic of soils as Chernozems, Russian word for “black earth”. Chernozems are mainly in a band that includes Croatia, northern Serbia, northern Bulgaria, southern Romania, Ukraine and Russia (Europe and Asia) and Canada (America), where climatic conditions favor the accumulation of humus. At other times, the dark color is due to the presence of compounds of reduced iron and manganese (as in Vertisols, black poorly drained soils), the presence of charcoal in soils from the Brazilian Amazon, Ecuador, Peru and some areas Africa (these soils are known as “Terra preta”, dark soil in Portuguese). Dark surface horizon (mollic horizon) in eastern Spain. Credit: Jorge Mataix-Solera. Click to see the original picture at Imaggeo. Clear or white. Usually due to the presence of calcium and magnesium carbonates, gypsum or other more soluble salts. Carbonates may show continuous or discontinuous patterns: nodules, fine powder or films on soil aggregates (pseudomycelia). Soluble salts such as NaCl, may form a surface white crust or be present in the soil matrix in a diffuse form. Carbonates and soluble salts may be present in the parent material or accumulate in soil due to the arid climate or other processes. In other cases, light color is due to a relatively high proportion of sand (quartz crystals), either in the whole soil or in profile horizons that have suffered extensive washing under very humid climate. Light color in a cacium carbonate-rich soil (southeastern Spain). Credit: Jorge Mataix-Solera. Click to see the original picture at Imaggeo. White salt crust (Mexico). Credit: Antonio Jordán. Click to see the original picture at Imaggeo. Red. The red color is usually a result of alteration of clay minerals, so it usually occurs in the argillic horizons. Weathered clay minerals release aluminium and iron oxides such as hematite (Fe2O3). This process is favored in hot climates with a long and intense dry season, as the Mediterranean climate. Reddish colors indicate good drainage and aeration of the soil, allowing the existence of oxidizing conditions to form oxides. In the Mediterranean basin, red soils are known as “Terra rossa” (Italian expression for red soil). Olive-cropped red soil (Andalusia, Spain). Credit: Artemi Cerdà. Click to see the original picture at Imaggeo. Yellowish brown/orange. Yellowish or orange colors may be due to the presence of goethite, FeO(OH), and bound to the clay and organic matter. Therefore, although composition is similar to some red soils, we know that these soils were formed under conditions of increased moisture availability red soil. Gleyic color pattern. The Russian word “gley” is used for mucky soil mass or clay. This color pattern is due to the presence of ferrous and ferric compounds. These colors are characteristic of Gleysols, developed under alternating reducing and oxidizing conditions. The mottled or marbled is presented as groups of spots of red, yellow and gray colors. This property appears in soils or horizons that are waterlogged for at least one part of the year. Sometimes it may be due to the activity of plant roots living in ponding. Usually, soils presenting this color pattern show reddish/brownish/yellowish colors in the surface of aggregates, pore surfaces or in the upper soil horizons (due to oxidized Fe3+ and Mn4+), and greyish/blueish colors inside the aggregates or in the deeper soil horizons (due to insoluble Fe2+ and Mn2+ compounds). Wet soil (Egypt). Credit: Sameh Abd-Elmabod. Click to see the original picture at Imaggeo. Green. The green color in the soil may be due to the presence of minerals such as glauconite, an iron potassium phyllosilicate mineral (mica group) or melanterite, a hydrated iron sulphate mineral. How do soil scientists describe soil color? The first thing to keep in mind (and a very common mistake among students) is that it is not describing soil color, but the color of the soil horizons. Normally, in a soil profile we find a variable number of horizons, each with a specific color as a result of its composition. The second one is that even with the most objective method, two soil scientists may come to discrepancies or argue heatedly. Expertise, subjectivity, light conditions or irregular ped surfaces may not help (even sunglasses or daltonism!). For this reason, many teams designate one person responsible for the determination of color (usually the strongest person). Soil color determination in the laboratory. Credit: Antonio Jordán. Click to see the original picture at Imaggeo. Finally, the third one is: what are you describing the color of? Even when describing a soil horizon, color may not be homogeneously distributed. Often, mottles or nodules different in color, abundance, contrast and size may be present. Coatings do not help. So, soil scientists may pay attention to these features (and describe!). Red colour (due to the massive release of dehydrated iron oxides, hematite), dark spots (manganese oxides) and a yellowish colour surrounding cracks and macropores were water flows (hydration and reduction of iron minerals). Credit: Antonio Jordán. Click to see the original picture at Imaggeo. 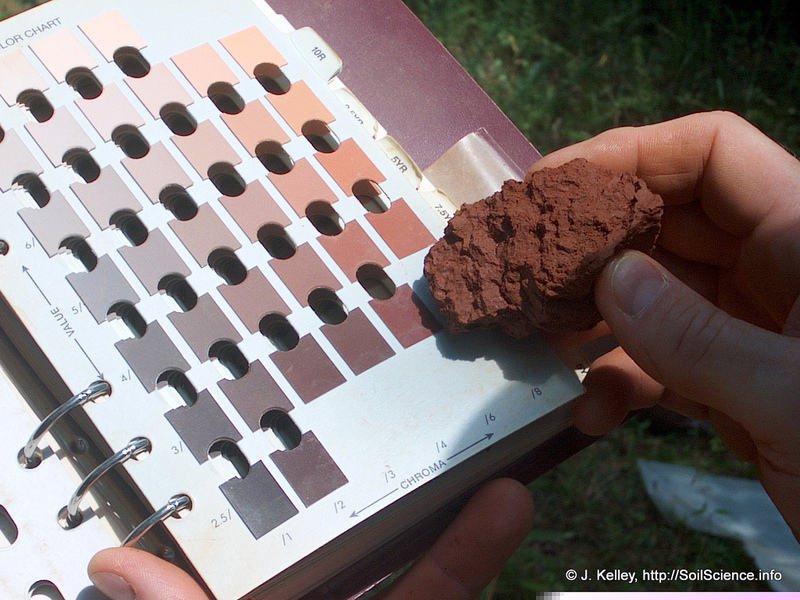 Soil colors may be technically described by the Munsell charts, separating the color shade components (relative to red, yellow and blue), value (lightness or darkness) and chroma (intensity or strength). For this, the color of a soil sample is compared to standard color samples, so that three parameters can be identified: hue, value and chroma. Optimum conditions for the assessment of soil color include direct sunlight, with light at right angle to the charts and soil moist. Hue. The hue indicates its relative position on a scale of 100 different grades of color. Hue depends on the wavelength (in short: the real color). The notation is based in 10 major classes: red (R), yellowish red (YR), yellow (Y), greenish yellow (GY), green (G), blueish green (BG), blue (B), purplish blue (PB), purple (P), reddish purple (RP). Grayish, blueish and greenish hues may be grouped as gley. Most common soil hues are gley, R, YR and Y. Gradation of each hue may be expressed as 2.5, 5, 7.5 and 10. The purest hue is 5, and lower and higher grades indicate mixtures ot other hues. Value. The value indicates the lightness or darkness of a color in relation to a neutral gray scale, ranging from absolute black (0/, absolute black, no light reflected) to absolute white (10/, absolute white, all light reflected). Chroma. Chroma indicates the degree of concentration of hue from a neutral gray with the same brightness. 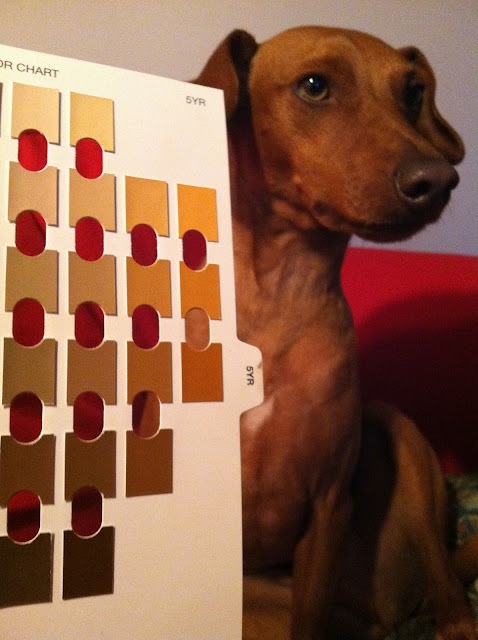 The chroma scale ranges from /0 to /10, /12, /14, or more, depending on the sample being examined, with lower chromas indicating increasing grayness. 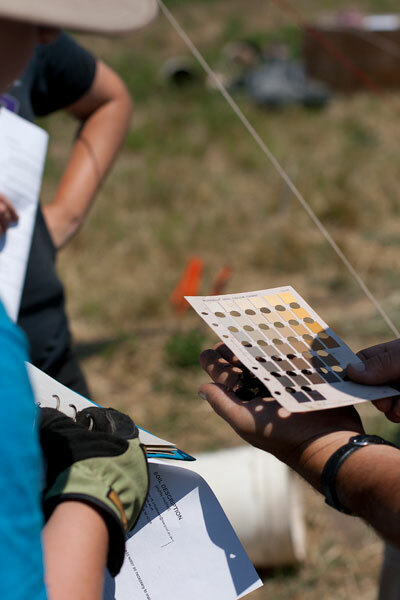 When determining soil color with the Munsell charts, the first step is selecting the correct hue. Each chart has a number of color chips arranged according to value and chroma. All chips from one chart have the same hue (this means: all chips in a page reflect the same wavelength). In each chart, color chips are arranged vertically from lighter (top) to darker value (bottom) and horizontally from lower (left) to higher chroma (right). Hue is designated by a symbol in the upper right hand-corner of each chart, and rows and columns are numbered according to the value and chroma. Usually, common soil names are given in the opposite chart (but this should be only orientative). For this step I recommend my students to hold the soil sample or aggregate in one hand and travel through the charts to find that they think matches the soil color. Soil color determination. Credit: Soil Science @ NC State (Flickr). Then, the soil sample must be placed behind the apertures of the chart in order to find the most similar color chip. Black and grey masks provided with the charts can be used for dark and intermediate/light samples to avoid disturbing contrast. When the correct chip is found, it is time to describe the color. Finding soil value and chroma. Credit: Center for American Archeology (Flickr). Let’s assume that the soil color in the next picture is the same that the chip in the third row, third column. We must find hue (upper right corner), value (row number) and chroma (column number): 5YR 6/3. In the opposite page, we can find the color name: light reddish brown. 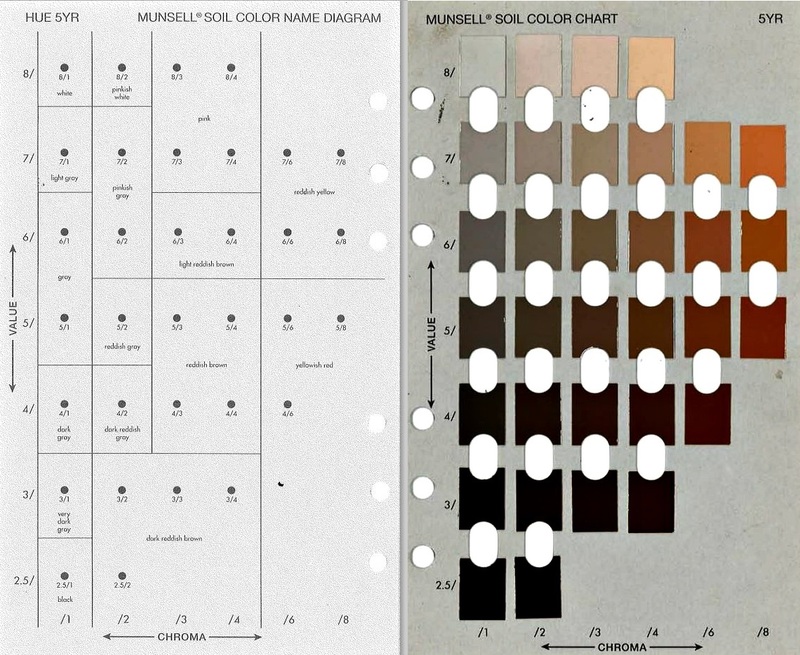 Munsell color charts may be used for many other purposes, not only soil color. Munsell color system is used in arts, science (geology, archeology, pharmacy, medicine, etc. ), education and industries (agronomy, food technologies, design, architecture, etc.). Even for fun! You can easily munsell people and animals. Barron, V., Torrent, J. 1986. Use of the Kubelka-Munk theory to study the influence of iron oxides on soil colour. European Journal of Soil Science 37, 499-510. DOI: 10.1111/j.1365-2389.1986.tb00382.x. Bodí, M.B., Mataix-Solera, J., Doerr, S.H., Cerdà, A. 2011. The wettability of ash from burned vegetation and its relationship to Mediterranean plant species type, burn severity and total organic carbon content. Geoderma 160, 599-607. DOI: 10.1016/j.geoderma.2010.11.009. Ben-Dor, E., Heller, D., Chudnovsky, A. 2008. A novel method for classifying soi profiles in the field using optical means. Soil Science Society of America Journal 72, 1113-1123. DOI: 10.2136/sssaj2006.0059. Erskine, W.D. 2013. Soil colour as a tracer of sediment dispersion from erosion of forest roads in Chichester State Forest, NSW, Australia. Hydrological Processes 27, 933-942. DOI: 10.1002/hyp.9412. He, X., Vepraskas, M.J., Lindbo, D.L., Skaggs, R.W. 2003. A method to predict soil saturation frequency and duration from soil color. Soil Science Society of America Journal 67, 961-969. DOI: 10.2136/sssaj2003.9610. Gómez-Robledo, L-, López-Ruiz, N., Melgosa, M., Palma, A.J., Capitán-Vallvey, L.F., Sánchez-Marañón, M. 2013. Using the mobile phone as Munsell soil-colour sensor: An experiment under controlled illumination conditions. Computers and Electronics in Agriculture 99. 200-208. DOI: 10.1016/j.compag.2013.10.002. Ketterings, Q.M., Bigham, J.M. 2000. Soil color as an indicator of slash-and-burn fire severity and soil fertility in Sumatra, Indonesia. Soil Science Society of America Journal 64, 1826-1833. DOI: 10.2136/sssaj2000.6451826x. Sánchez-Marañón, M., García, P.A., Huertas, R., Hernández-Andrés, J., Melgosa, M. 2010. Influence of natural daylight on soil color description: assessment using a color-appearance model. Soil Science Society of America Journal 75, 984-993. DOI: 10.2136/sssaj2010.0336. Sánchez-Marañón, M., Huertas, R., Melgosa, M. 2005. Colour variation in standard soil-colour charts. Soil Research 43, 827-837. DOI: 10.1071/SR04169. Sánchez-Marañón, M., Soriano, M., Melgosa, M., Delgado, G., Delgado, R. 2004. Quantifying the effects of aggregation, particle size and components on the colour of Mediterranean soils. European Journal of Soil Science 55, 551-565. DOI: 10.1111/j.1365-2389.2004.00624.x. Terefe, T., Mariscal-Sancho, I., Peregrina, F., Espejo, R. 2008. Influence of heating on various properties of six Mediterranean soils. A laboratory study. Geoderma 143, 273-280. DOI: 10.1016/j.geoderma.2007.11.018. Thompson, J.A., Bell, J.C. 1996. Color index for identifying hydric conditions for seasonally saturated mollisols in Minnesota. Soil Science Society of America Journal 60, 1979-1988. DOI: 10.2136/sssaj1996.03615995006000060051x. Torrent, J., Schwertmann, U., Schulze, D.G. 1980. Iron oxide mineralogy of some soils of two river terrace sequences in Spain. Geoderma 23, 191-208. DOI: 10.1016/0016-7061(80)90002-6.
van der Waals, J.H. 2013. Soil colour variation between topsoil and subsoil horizons in a plinthic catena on the Mpumalanga Highveld, South Africa. South African Journal of Plant and Soil 30, 47-51. DOI: 10.1080/02571862.2013.777132. Wills, S.A., Burras, C.L., Sandor, J.A. 2007. Prediction of soil organic carbon content using field and laboratory measurements of soil color. Soil Science Society of America Journal 71, 380-388. DOI: 10.2136/sssaj2005.0384. Yang, S., Fang, X., Li, J., An, Z., Chen. S., Hitoshi, F. 2001. Transformation functions of soil color and climate. Science in China. Series D: Earth Sciences 44, 218-226. DOI: 10.1007/BF02911990. This post was published simultaneously in G-Soil. Soil colors – what more could you want?